Humankind is unique in the animal kingdom in our ability to creatively utilize energy. Over the history of humankind, the primary source of energy we’ve used has changed from self to dung to wood to hydro to coal to petroleum, and now we are transitioning toward renewables and energy from the sun. (It’s worth noting that the sun has always been our ultimate energy source – prior primary energy sources were merely solar energy absorbed and stored as bio or fossil fuels.) In fact, fuels could be said to have a product lifecycle, and two new regulations may shorten the product lifecycle of LNG/CNG in California. On December 14th, the California Air Resources Board (CARB) announced that it had approved the Innovative Clean Transit (ICT) regulation, setting a statewide regulation for public transit agencies to transition to 100 percent zero-emission bus fleets by 2040. According to CARB, eight of the ten largest transit agencies in the state are already operating zero-emission buses, including battery electric and hydrogen fuel cell vehicles. Deployment of zero-emission buses is expected to accelerate rapidly in the coming years – from 153 buses today to 1,000 by 2020, based on the number of buses on order or planned for purchase by transit agencies. Altogether, public transit agencies operate about 12,000 buses statewide. In addition to the ICT, on February 21st, CARB will consider a regulation to require the fixed route airport shuttles (FRAS) that serve California’s 13 largest airports to transition to 100 percent zero-emission vehicles (ZEVs) by 2035. The proposed regulation would apply to public and private fleets, including operators of parking facilities, rental car agencies, and hotels. According to staff reports behind these regulations, approximately 7,000 transit buses and 800 FRAS are fueled by compressed natural gas (CNG) or liquified natural gas (LNG). Most of these natural gas vehicles were implemented as a result of the existing and fully implemented Transit Fleet Rule (TFR) that was adopted in 2000 and amended in 2004 and 2006. The TFR was designed to serve as a diesel airborne toxic control measure that requires public transit agencies to use the best available control technologies to reduce nitrogen oxides (NOx) and particulate matter (PM). The TFR also dovetailed nicely into the implementation of the Low Carbon Fuel Standard (LCFS) in 2011. 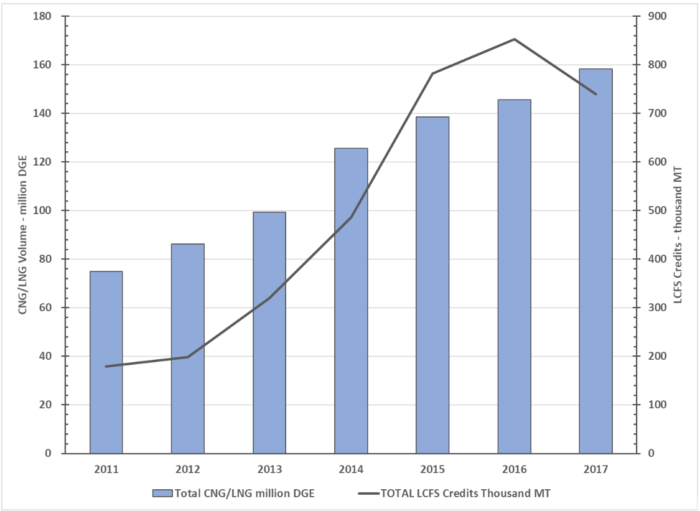 The following figure illustrates how the CNG/LNG from fossil natural gas has grown in the LCFS program both in volume and in LCFS credits. In 2017, over 67 percent of the CNG/LNG volume was renewable natural gas, and that renewable volume has grown each year displacing fossil natural gas. Using the data from CARB’s ICT and FRAS staff reports for fleets, mileage, and fuels, we estimate that about 70 percent of the CNG/LNG currently reported under the LCFS for transportation will be impacted by these two new regulations. The transition to ZEV fleets in these applications may be the first large-scale displacement of a low-carbon fuel or technology with another low-carbon fuel or technology that falls under the LCFS. This change is not driven by a fuel-neutral difference in Carbon Intensity (CI), instead, it is driven by another CARB program mandating a switch to ZEVs in the same fleets in which it once encouraged the switch to CNG/LNG. If CARB adopts the ICT and FRAS regulations, CNG/LNG suppliers will need to scramble to develop markets to replace the transit and airport fleets they will lose to ZEVs. This market impact is just one example of the often-perilous regulatory landscape in California. This constantly shifting landscape includes many initiatives beyond the LCFS and Cap & Trade programs, and this compilation of regulations both creates and removes opportunities.